These are great! How cute and stylish. Anyone that would clip a bag to them selfs is obviously not interested in style so I really don’t think the two bags can be compared. These are okay, but I use ChicoBag (www.chicobag.com), which also stuff into their own pouch. Only ChicoBag has a clip so I can clip it to my key ring or purse strap. Jean— when you were in Philly at the Indie Designers Expo, did you see the “sustainably chic” string totes by Jessa Blades? I think they are pretty cute. Almost as cute as a Popple! 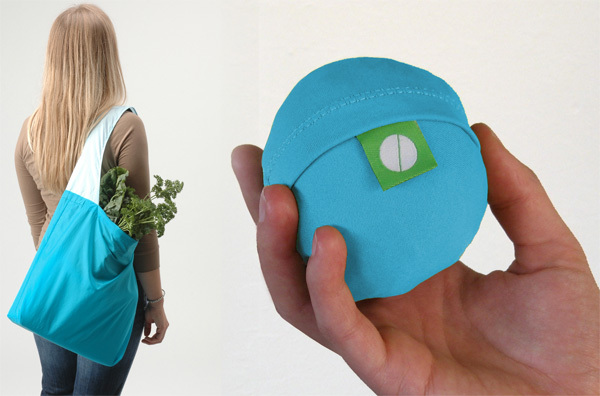 The first compact reusable bag I became aware of was the Chico bag (http://www.chicobag.com/) which also has its own attached pouch. Not as cool as one that turns into a ball like the one above though! Wow, this is probably the best reusable bag design I’ve seen so far. And it’s great to see that has a big handle and comes in a variety of stylish colors. I’m surpirsed there hasn’t been a mad Popple comeback. Like “My Little Pony” or “Strawberry Shortcake”.